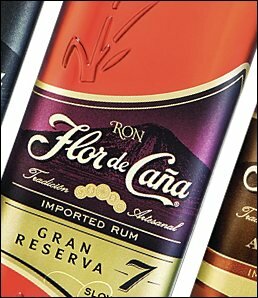 Flor de Caña Slow-Aged, estate-grown rum from Nicaragua has a new bottle and label design to reflect its global growth. Flor de Caña's new bottle and label designs were created in response to a growing worldwide popularity of Flor de Caña’s premium and ultra-premium rums, rums that have been distilled and traditionally crafted from estate-grown sugar cane by the same family in Nicaragua since 1890. One of the most popular rums in Central America, Flor de Caña has seen a double-digit growth per year over the past decade and is now available in 40 countries. The brand is on track to sell more than 1 million cases in 2013. The quality of the glass has been enhanced, the bottles etched with stalks of sugar cane and the label design evokes the brand's origins by superimposing the logo over a volcano – a reminder that Flor de Caña is the rum of Nicaragua, land of lakes and volcanoes. For Flor de Caña's 4, 5 and 7-year-old ‘mixable’ premium rums in the Slow-Aged collection, the new design maintains the familiar bottle shape, but the height has been increased and the sides rounded for a better hand feel. For Flor de Caña’s award-winning 12 and 18 year-old super-premium single-estate rums in the Centenario Collection, the smooth rectangular shape of the bottle has been maintained while adding height, a more masculine look and heavier glass.